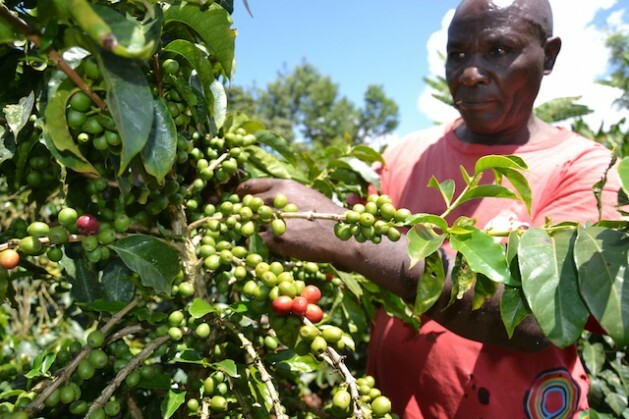 NAIROBI, Nov 4 2014 (IPS) - Coffee farmer Gabriel Kimwaki from Nyeri County, in central Kenya, is considering “giving up farming altogether”. Kenya was reclassified as a middle-income country in early October, but as this East African comes to terms with its new ranking, it is becoming clear that status alone will not result in fewer people going to sleep hungry. There is still a great need to address the plight of Kenya’s poor, as agriculture remains the backbone of the economy. According to the Kenya National Bureau of Statistics, based on a five-year average from 2009 to 2013, the agricultural sector’s contribution to the GDP is now estimated at 25.4 percent — up from 24.1 percent. The contribution that small-scale farmers like Kimwaki make cannot be overemphasised with government statistics showing that small-scale production accounts for at least 75 percent of the total agricultural output and 70 percent of marketed agricultural produce. The sectors include agriculture, telecommunication, real estate and manufacturing — the latter sector’s contribution to GDP has risen from 9.5 percent to 11.3 percent, according to Braganza. The country’s GDP is now estimated at 53.4 billion dollars compared to 42.6 billion dollars before the revision, making Kenya the ninth-largest economy in Africa, up from the 12th position. Kenya’s gross national income rose to 1,160 dollars, up from an estimated 840 dollars before the revision. According to the World Bank, a country is classified as middle income if its gross national income per capita — a nation’s GDP plus net income received from overseas — surpasses 1,036 dollars. He said that economic growth alone would not eliminate poverty. “Growth must be accompanied by development. It is development that reduces poverty because it addresses issues like access to education, health services, jobs and so on,” Braganza said. The government would also be able to see which sectors can potentially bring in revenue, and tax them accordingly, thereby exploiting the potential that each sector has to the fullest. But Ndebu said this could have a downside effect if the sectors are taxed too heavily and could discourage investment and innovation particularly in the telecommunication industry which pioneered mobile payments technology. But this is not the only implication. Kenya could also be overlooked by donors. Jason Lakin, the country manager at International Budget Partnership Kenya, told IPS that donors have in recent years focused on the poorest countries and a middle-income country may not be prioritised for funding. He said that low-income countries generally qualify for more generous assistance. “Take the World Bank’s International Development Association (IDA) credits, which are loans given to countries on very concessional terms [low interest and long repayment periods]. Middle-income countries will not qualify for these terms,” he explained, adding that middle-income countries may still get loans at higher rates or over shorter repayment periods. “Kenya may not find donor financing as attractive when the interest rates are higher and repayment periods shorter because it has now shown that it can borrow internationally,” said Lakin. While market rate borrowing may still have higher rates than donor financing, experts say that donor funding usually has other conditions, making it less attractive for a country with other options. “Donor aid is very significant because it is used in social sectors where people are in very severe poverty conditions,” he said. Ndebu added that there was also aid that does not go through the national budget but through non-government organisations, which significantly complemented government projects.